Barcelona outlasted Atletico Madrid in a wild Copa del Rey semifinal second leg, winning 3-2 on aggregate in a match that ended with Barcelona down to nine men and Atletico down to 10. After absorbing a bunch of early pressure from Atletico, Barcelona turned to its star tandem to add to its first-leg edge. Already nursing a 2-1 lead thanks to a road win in Madrid last week, Barcelona padded it through Luis Suarez, who touched home a rebound off a saved Lionel Messi shot, following a classic Messi dribble. The goal, just before halftime, gave Barcelona 1-0 lead on the day and forced Atletico to need two goals in order to extend its stay in the competition. 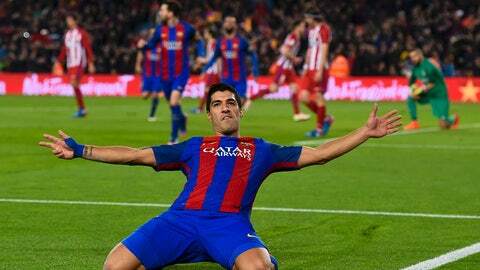 Messi and Suarez each scored fantastic goals in the first leg, but Antoine Griezmann's late goal gave Atletico Madrid hope entering the second leg at Camp Nou, where Atletico Madrid has not won for 10 years. Griezmann thought he had scored again to bring Atletico back within one on Tuesday, but he was controversially ruled offside in the 59th minute. With both players reduced to 10 men after red cards to Sergi Roberto and Yannick Carrasco, Atletico missed another chance in the 78th minute, when Kevin Gameiro was granted a penalty following a whistle on Gerard Pique. He missed the ensuing penalty, though, hitting it high and over the bar and keeping Barcelona in command. That is, until Gameiro had his next chance. Griezmann unselfishly set up his countryman for a simple finish, setting the stage for a tense final 10 minutes. Things got more interesting later when Suarez was booked twice in a five-minute span, reducing Barcelona to nine men. Barça held on after a furious finish, but it won't have the suspended Suarez for the final, which will be against either Celta Vigo or Deportivo Alaves.